← What’s going on in Downtown Brampton? Brampton, my hometown, has a great network of parks, many of which are connected by multi use paths that follow local waterways like the West Humber River and Etobicoke Creek. In suburban neighbourhoods where curvilinear street networks and cul-de-sacs predominate, these paths are necessary as shortcuts for pedestrians and cyclists, and for anyone looking to take a stroll away from the busy arterial roads. 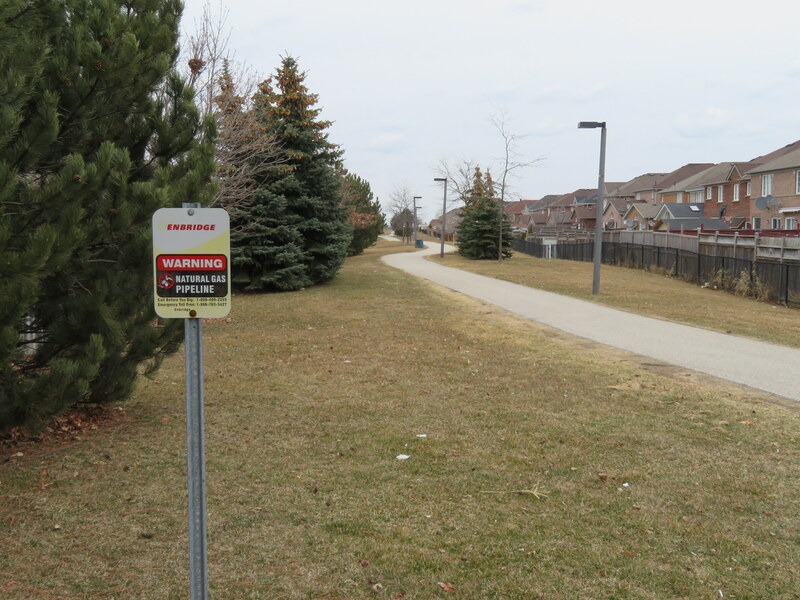 But these multi-use paths, called “recreational trails” by the City of Brampton, do not properly accommodate all users. And where these paths meet major streets, users must either detour far out of their way to a designated crossing, or attempt to cross a busy roadway. Where Toronto and even other suburban municipalities can get this right, Brampton consistently gets it wrong. Entrance to Addington Park at Balmoral Drive, Brampton. Part of the Don Doan Trail. The first problem Brampton has is the consistent lack of curb cuts where a park path meets any roadway, be it a residential side street or a busier road. Curb cuts are necessary not just for cyclists, but for pedestrians with strollers, or anyone using a mobility device such as a walker or wheelchair. In many cases, a nearby private driveway or a nearby intersection can provide the necessary curb cut, but this is not always the case. Perhaps the reason not to provide the cut is to discourage cyclists or children with wheeled toys crossing without stopping and dismounting, or preventing motor vehicles from entering the path. But it instead encourages cyclists to ride on the sidewalk instead, where most cyclists shouldn’t be, and makes it more difficult for parents with young children, or pedestrians with disabilities from using the paths. Milton, another suburban municipality with similar paths, has curb cuts where their trails meet cross street. These crossings, like the one shown below, are simply marked with a stop sign with a metal “p-gate” barrier to slow down cyclists and keep cars out of the pathway. Milton, where curb cuts are provided for accessibility and convenience. Where longer distance trails are signed, like the Don Doan Trail or the Esker Lake Trail, both of which follow waterways, they are disconnected by major roadways, and users are expected to make long detours on narrow sidewalks. The Esker Lake Trail, connecting Norton Place Park and Laurelcrest Park, is cut off by Queen Street East, a six-lane road. Signs direct users to cross at West Drive, where Queen Street widens to nine lanes, including channelized right turns. Brampton’s park paths generally follow waterways, which run north-south. East-west active transportation connections are lacking, with one exception, a natural gas pipeline corridor just south of Sandalwood Parkway. Here, the City of Brampton built what could be a really useful longer-distance trail, even if it is split up by Highway 410. But at all points where the path meets a road way, curb cuts are not provided. Brampton’s pipeline pathway, whose utility is limited by the lack of curb cuts. Where the pipeline corridor crosses a major street, like Bramalea Road, there is no crosswalk, or even a median refuge island to help pedestrians cross a busy road. But there are bus stops on both sides of the street. As a transit user living nearby, or a path user, would you want to walk to the signalized crossing in the distance, a five to ten minute walk, or try to cross the street here? 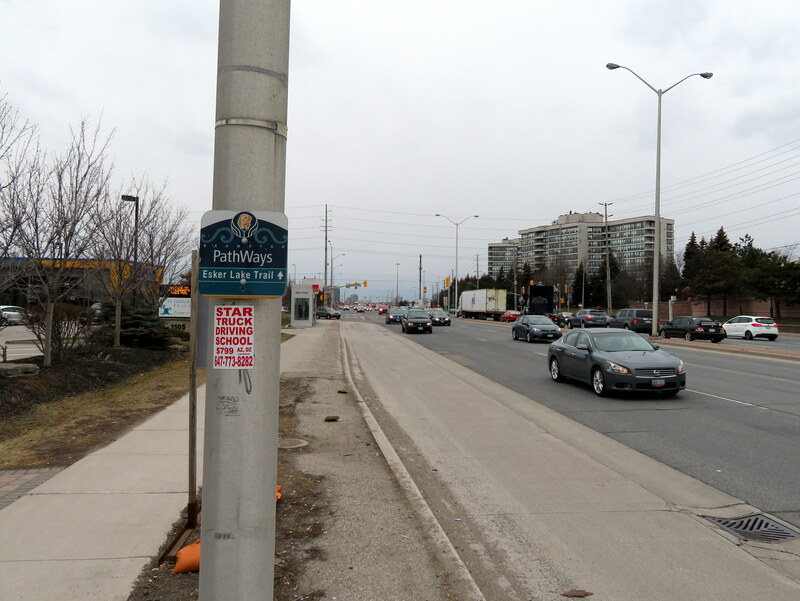 The pipeline corridor crosses Bramalea Road, but there is nothing to help pedestrians cross the traffic arterial. Note the bus shelter. A similar multi-use path, the Burlington Centennial Bikeway, follows a similar utility corridor between Burloak Drive and Downtown Burlington. Yet at every intersection, curb cuts are provided for cyclists and anyone using a wheeled device. At major streets, like at Appleby Line, traffic signals allow everyone to cross safely. At many residential streets, the roadway is narrowed at trail crossings. If Burlington can do this, why can’t Brampton? Brampton, at least has a good strategy to promote active transportation, and there are some visible improvements. On many major roadways, shared use paths are built, wider than sidewalks and paved with asphalt. Newer paths maintained by the city have signage and markings that make it clear that cycling is encouraged in these places, but that pedestrians also belong. On McVean Drive and Chinguacousy Road, these paths lack the “cyclists dismount” signs at intersections that plague many similar routes. But to encourage both recreational and commuter cycling, and to make trails fully accessible to all users, curb cuts are required at all path entrances, and safe crossings provided where these paths meet major roads. This is the standard in other suburban municipalities, and should be the standard in Brampton as well. 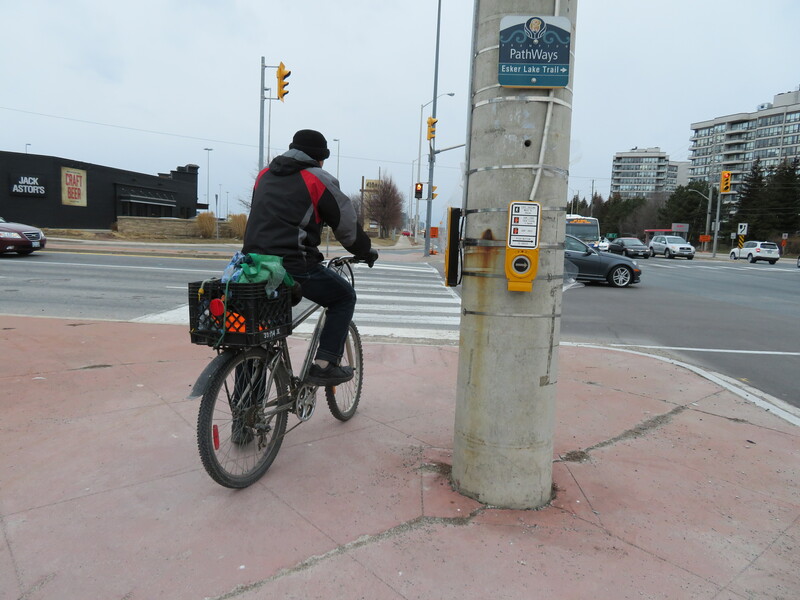 This entry was posted in Brampton, Cycling, Parks, Walking and tagged Brampton, Burlington, Cycling, Multi Use Paths, Recreational Trails, Trails, Walking. Bookmark the permalink. Brampton does not have path problems that are multi-use. You argue Brampton has multi-use-path problems. Hyphenation does not max out at two words, otherwise how could operating a right-hand-drive Land Rover trigger ice-cream-headache-like symptoms? Your headline would be better as “Problems with Brampton’s multi-use paths.” And you slug should never have been the whole headline with dashes between words, as you see now. Curious as to where they draw the line between recreation and loitering!